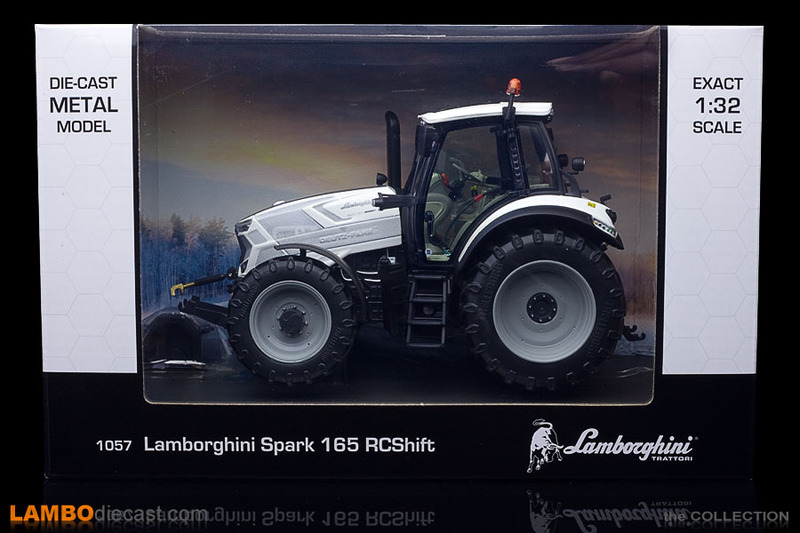 Another recent Lamborghini tractor, this time the Spark 165 RCShift recreated in 1/32 scale by Weise Toys I just couldn't resist adding to my collection of Lamborghini cars, it seems 1/32 scale is very popular among tractor models, I've found a lot of additional items you can add to this kind of models. 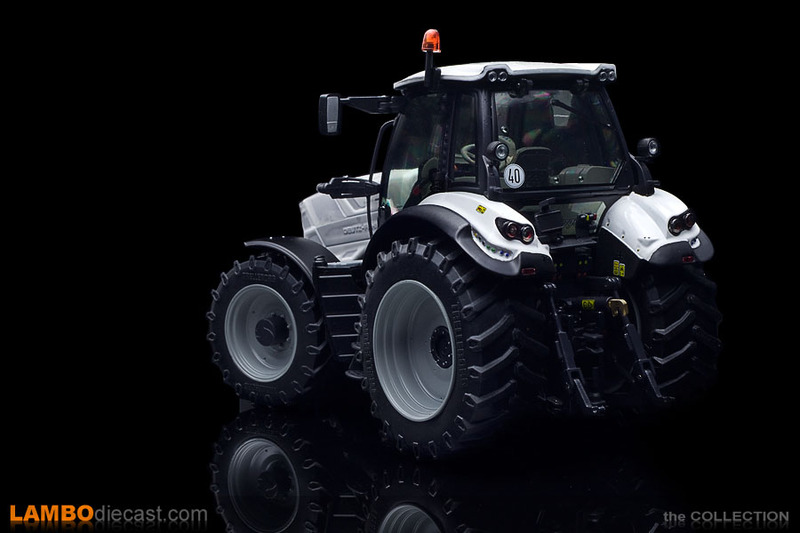 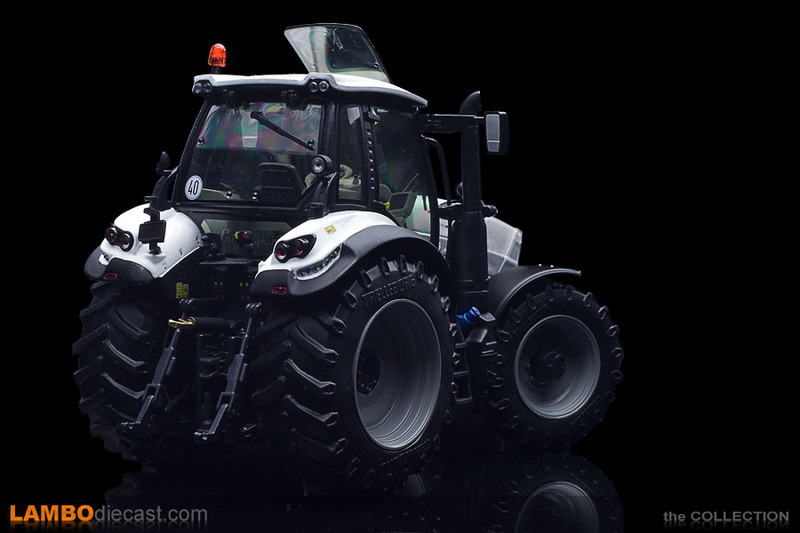 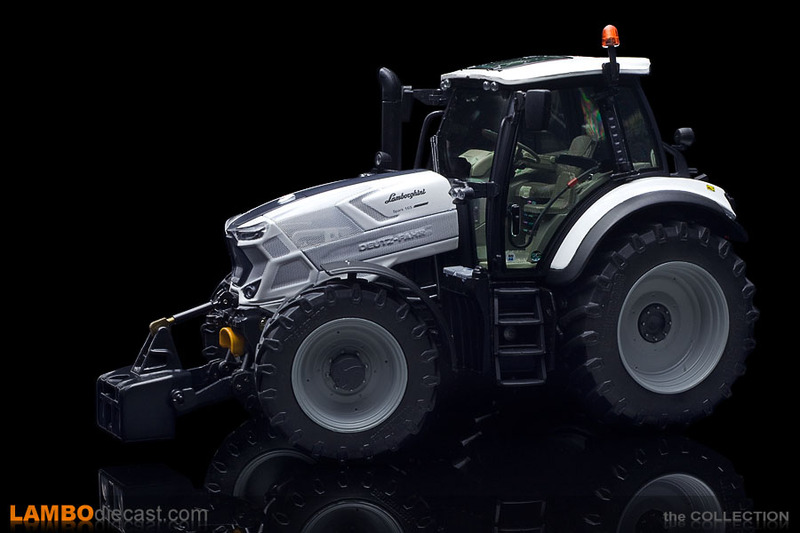 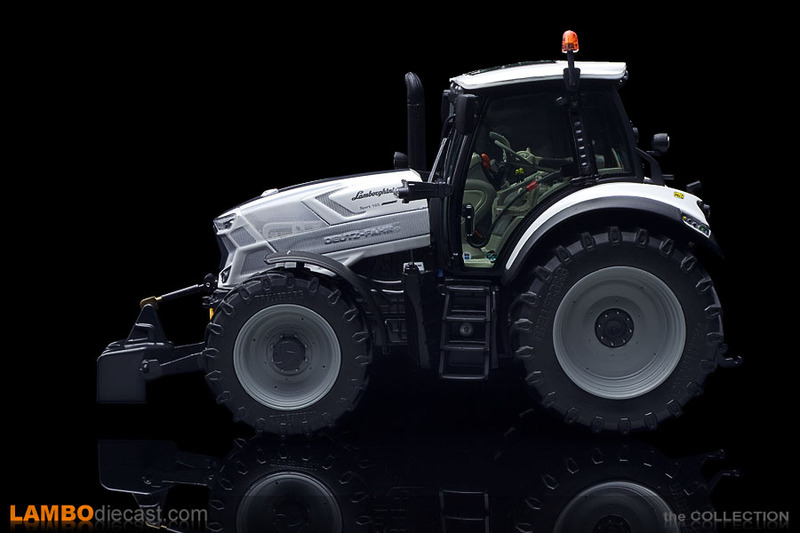 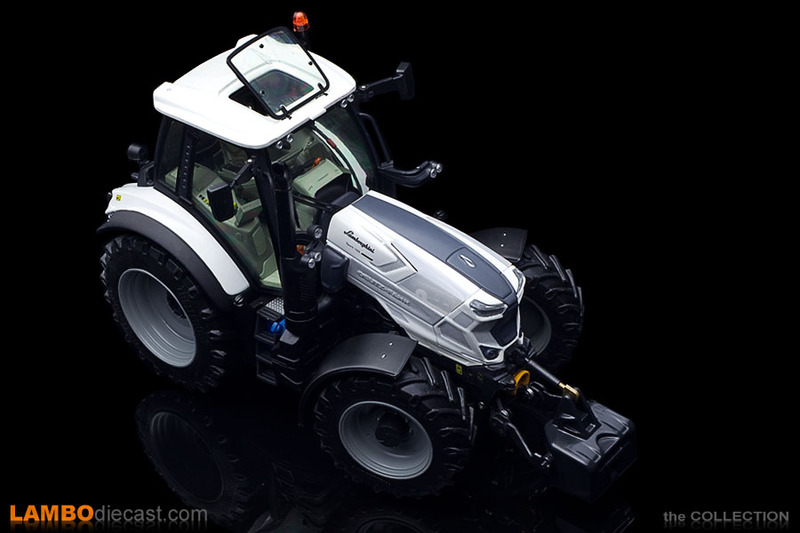 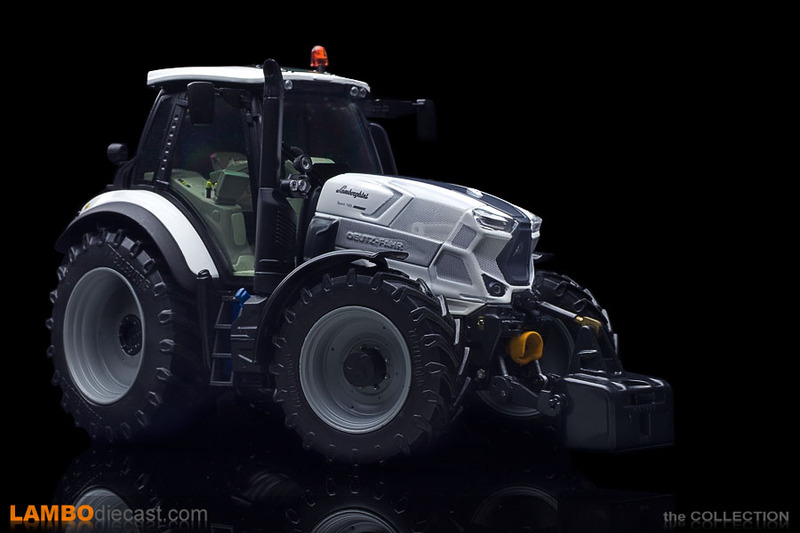 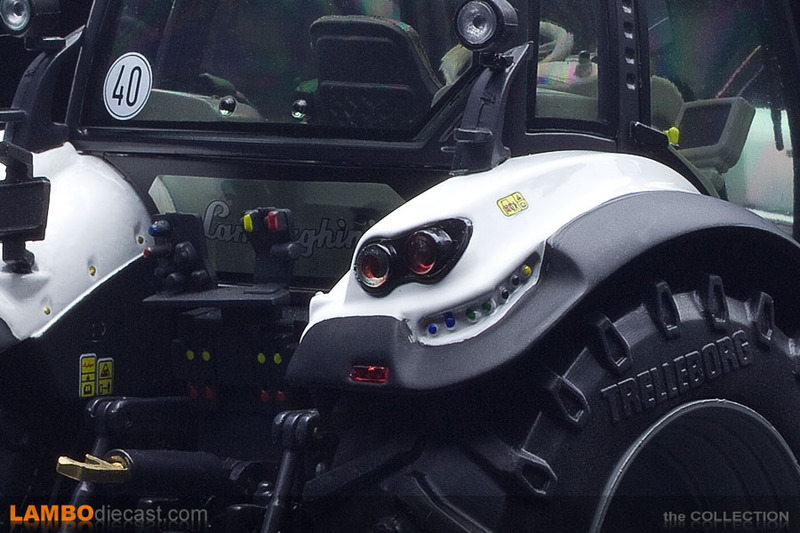 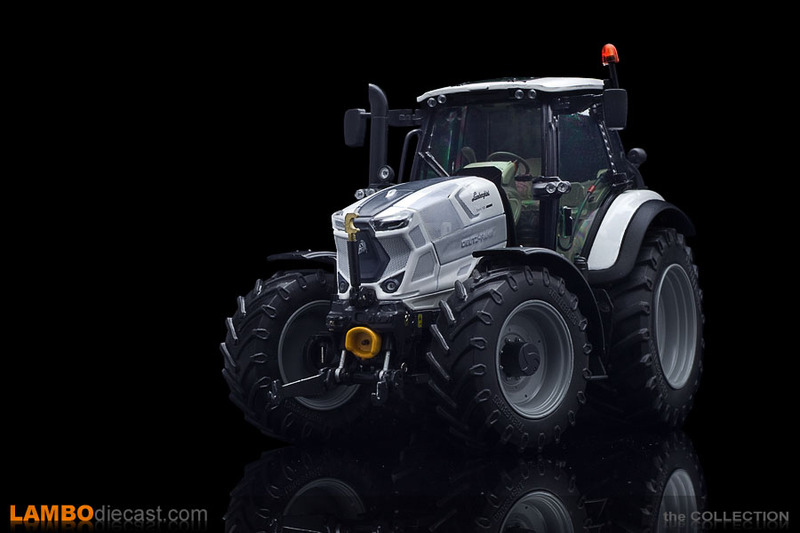 The Lamborghini Spark 165 RCShift is one of the largest tractors currently made by Lamborghini Trattori, with a Deutz TCD 6-cylinder, 6,057cc engine offering 164 hp (the top of the line Spark comes with 212 hp), note that the Spark 165 weighs over 7,000 kg and has a width of about 2,500 mm, the Lamborghini Spark line offers a 9,700kg lifting capacity. 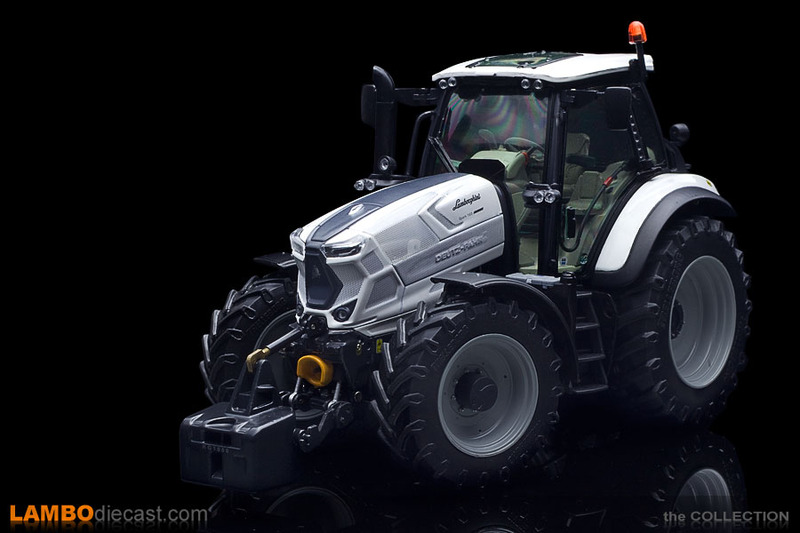 A quote from Lamborghini Trattori : "The most distinctive feature of the new Spark 155-215 family is the new ZF Powershift transmission with 6 forward speeds, 3 reverse speeds and 5 ranges to offer a total of 30+15 speeds or, with the addition of the creeper gear, 54+27 speeds. 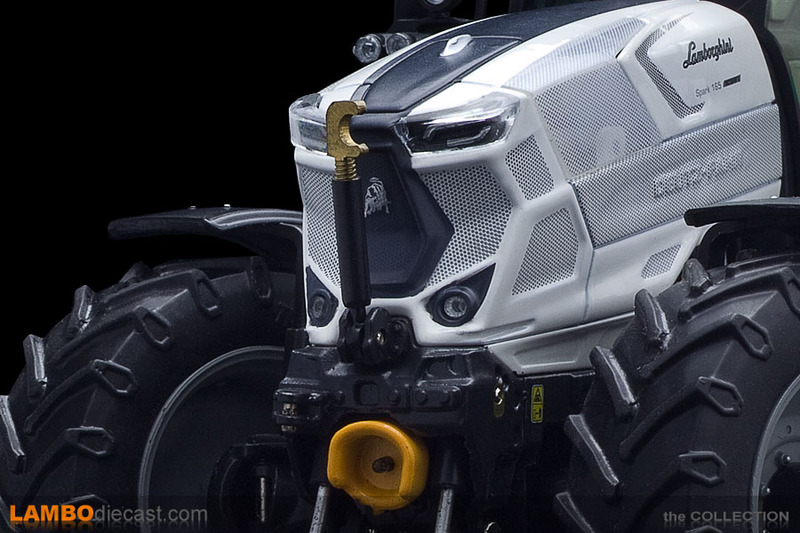 RCshift versions are equipped with a fully automatic transmission with robotized range selection. 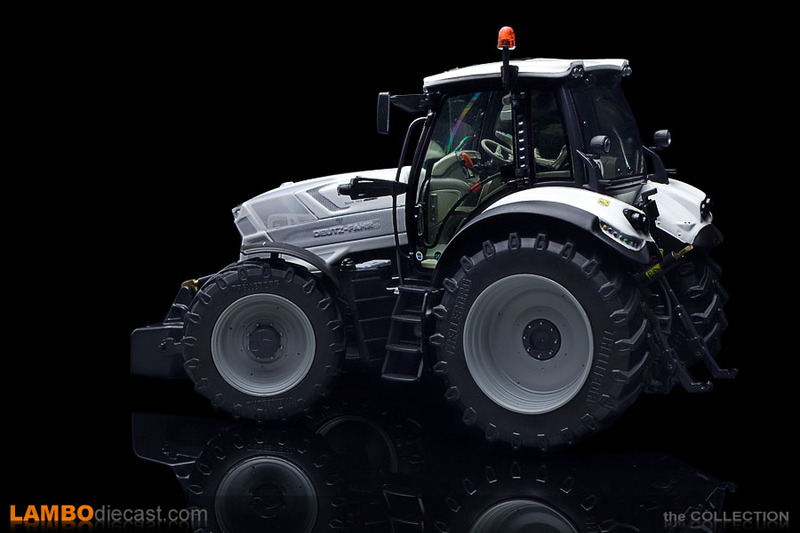 The new ZF transmission lets the tractor reach a road speed 40 Km/h at an engine speed just over 1200 rpm. 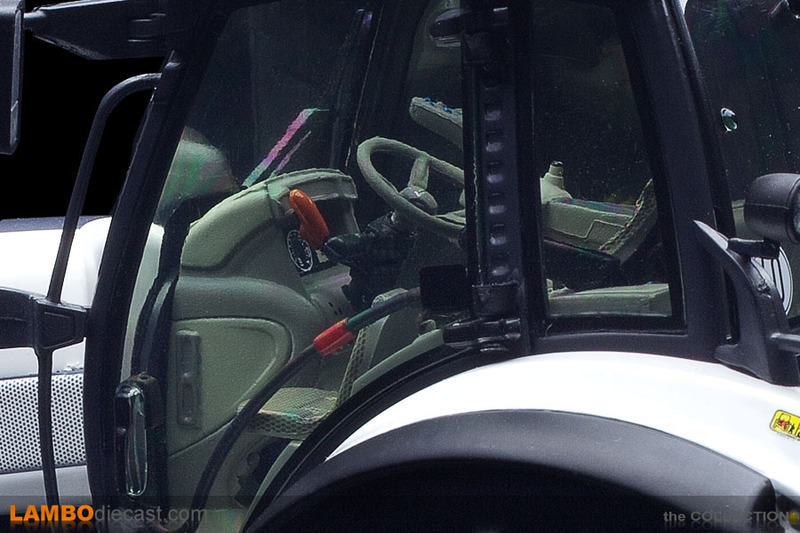 On top of all this is an intelligent transmission management system, which tailors the characteristics of the transmission itself to the driving style of the operator." 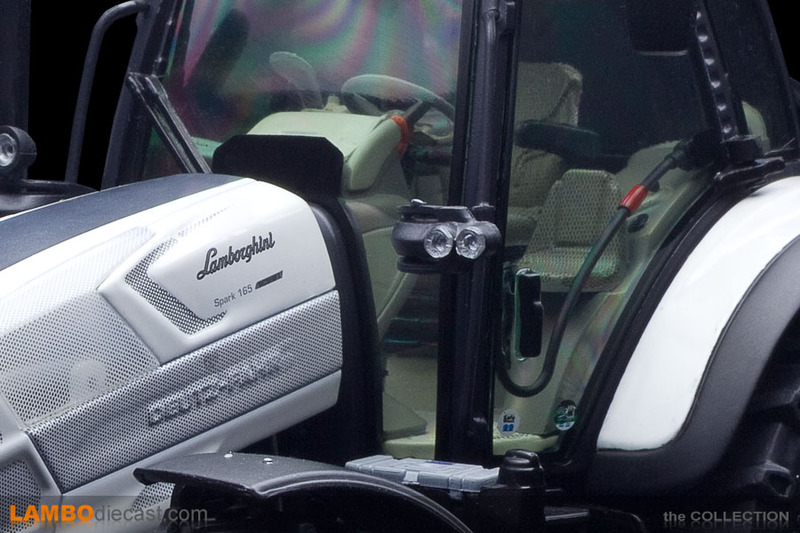 "The new MaxiVision and MaxiVision 2 cabs are now separated from the engine hood and offer superlative levels with easy to use controls and functions. 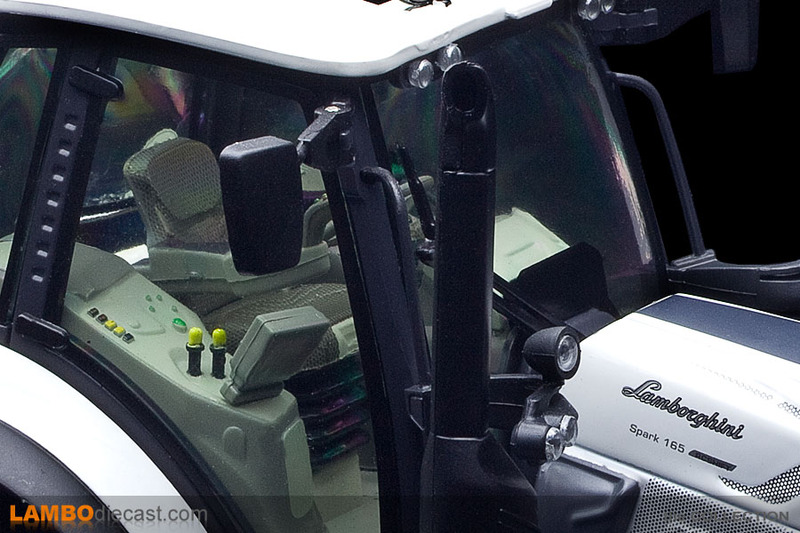 Three different versions of the panoramic roof are offered, while the new InfoCentrePro unit has a 5” color display and works in conjunction with the armrest with an all-new multifunction joystick. 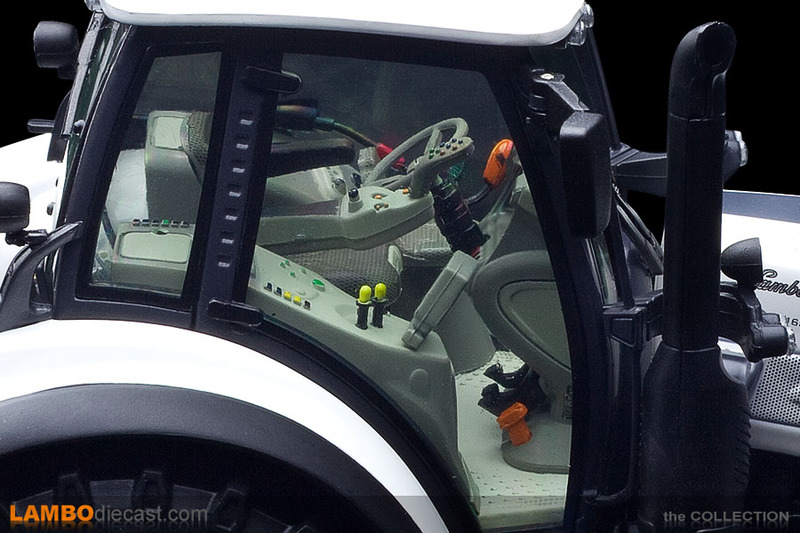 The joystick includes the Comfortip function, letting the driver set ground speed and select the drive direction easily, and also controls the front and rear lift and numerous other automation functions. 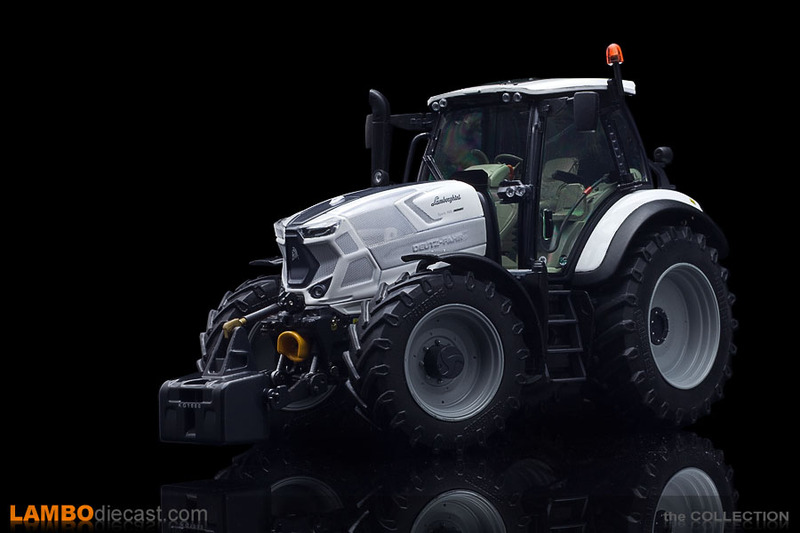 The new Spark 155-215 family is also ready for ISOBUS and the most advanced Precision Farming systems, the functions of which can also be managed from the 12" iMonitor3. 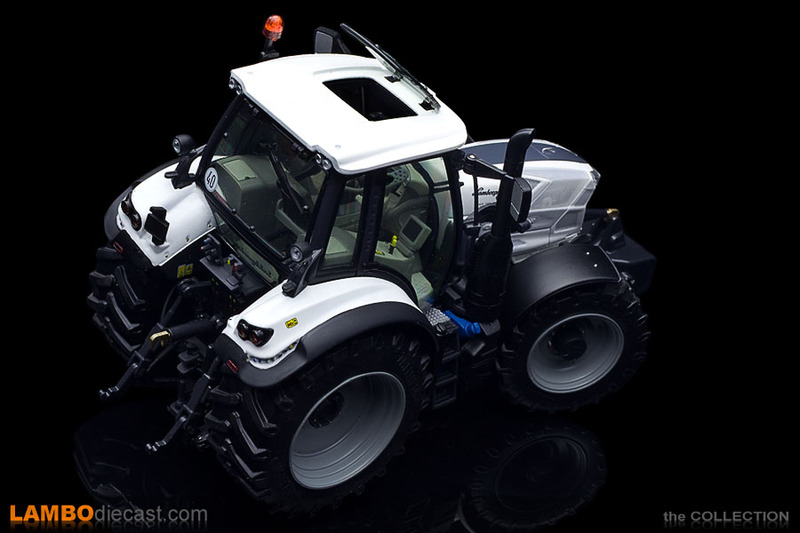 Other options include two independent video cameras, a 40,000 Lumen LED pack in 4 light units, and supplementary solutions adding wireless data management and transmission capability to the tractor systems." 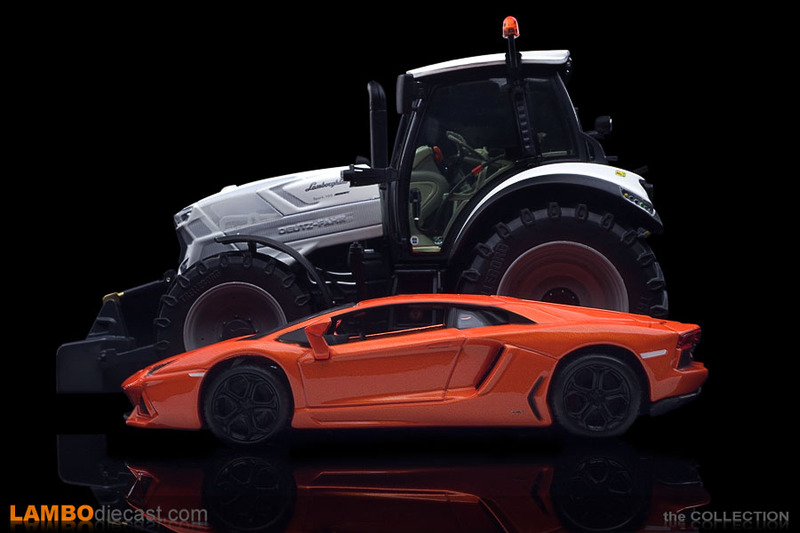 If you look at scale cars the 1/32 scale is not so popular, and some of the better scale cars are in fact from the slotcar series, so I had to search my boxes to find a 1/32 scale Lamborghini Aventador LP700-4 made by Bburago to put next to this tractor to show the massive size of the Spark 165. 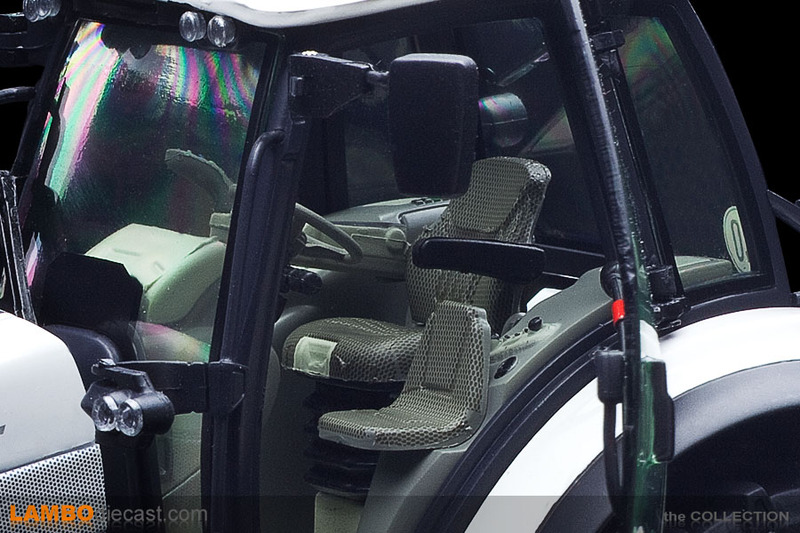 I really like the attention to detail on this small scale model, the interior looks really nice, and there is even an upholstery on the two seats, the displays and the joystick look good, but keep in mind this is a rather costly model in the end, at €70 I found a deal as usually these models are listed for sale at €80 and more. 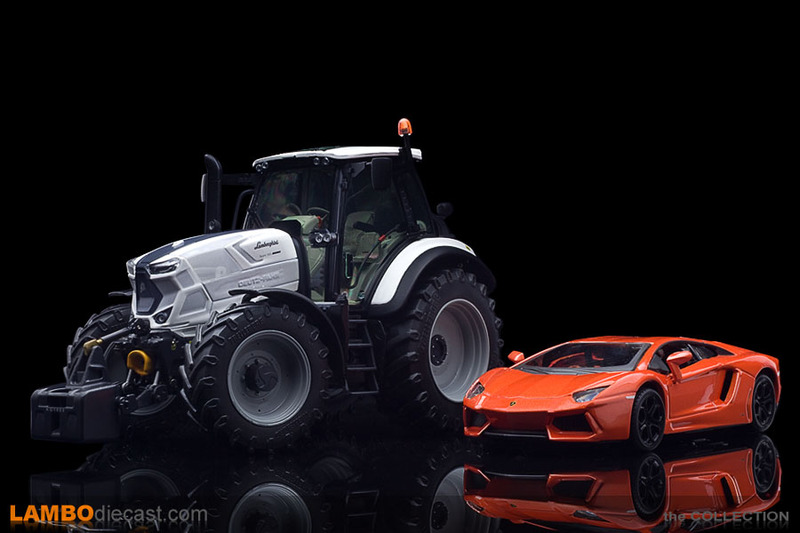 I do like adding some Lamborghini related items to my collection, and you can't get any more related than tractors, sure they have nothing to do with Automobili Lamborghini SpA anymore, but still these massive workhorses proudly show the Raging Bull logo at the front, so if I can locate a scale model I try to add it anyway.